Feels like polyester or acetate and lace with extensive detailing. lace design on sleeves. Inside lining, extended train. with an extended train. Beads, sequin and silk covered buttons. full out skirt. Cream lace falls gracefully in tiers on the front and back. Beautiful colors and textures play together to create a unique piece. All eyes will be on you! Still I believed. Decorated throughout with lace, sequins and pearls. No visible stains. Bra pads need to be replaced. Sleeve: 25". Shoulder to shoulder: 14". It is very small. The design is very pretty and no train. 3 piece Stunning very heavily embroidered velvet Lengha with pyjami and a duppatta/chunni. The lower part of this dress has both silver,cream and a gold coloured flared skirt, encased in a chiffon polyester style blue heavily embroidered outer layer. Brand New Wedding Dress With Tags. 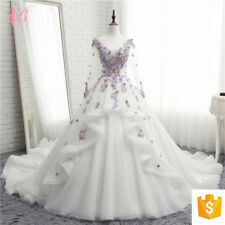 Lovely and brand new wedding dress for a very romantic lady. Please note that it came without a box. 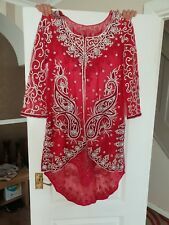 2pc red wedding dress, heavy silver embroidery. size 14/16. The top is see through, worn with a red blouse (blouse missing). The trail is long and at bottom Crinoline is included, gives the dress a cinderella affect. ( not a Chinese copy by the way). IVORY UK 14 BRIDAL GOWN. I had taken a break from it all but am now getting back to my hobby. hence I would estimate 4 weeks to bead and sequin and maybe rhinestone if wished.